Hi guys, it never rains but it pours - literally too! The lovely sunshiney weather has all gone and the rain clouds have really gathered around us! We came back from our lovely, wee Respite break, all happy and rested and banged right into another health crisis for Coo. He is so very poorly. He has aches and pains, a high temperature, an increase in seizures and the makings of a really bad cold! Now, if you or I have a cold, it's a bit of a pain but with Coo? It's a whole other ball game! For us, that's not an easy one to answer! Coo hates hospital admissions. We both do, they're always problematic, stressful and downright difficult and are always a last resort, if things can be contained and managed at home then...they will be! I nursed things around the clock over the last five days but nothing worked and his temperature remained high around 39 degrees and as he refused the hospital again, it was back to our GP today. Coo has a chest infection, it's not pneumonia - this time, thank goodness for that but it's back on the antibiotics for yet another run! We're back in Anti-bio-land again but I'm hopeful things will start to improve once they kick in and until then? 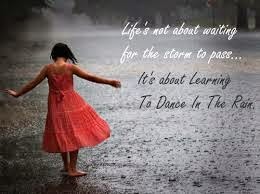 Here's to some successful rain dancing! hi maz,im a newbie at blogging,so bear with me.im a full time carer for my daughter . she is 22 yrs old. Hi Lottie, thanks for stopping by. Caring is such a roller-coaster ride at times isn't it! I find blogging is kinda therapeutic and you're right Caring is a bit over-whelming at times. Dig around the blog and if you think of anything - ask away!